We have 50 years of experience in all aspects of construction, including custom design, new homes, commercial properties, remodels, kitchens, bathrooms, additions and insurance restoration. 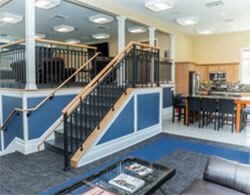 Welcome to Nurzia Construction, Hudson Valley's leading Design/Build, full service contractors and custom builders. As an accredited, award-winning construction company, we are able to provide turnkey construction services on any project you might need. We have three divisions to provide the exact care and expertise your property requires: Residential, Commercial and Insurance Restoration. If you’re in need of construction or remodeling for your home or property, call our team of experts to set up your free consultation now. We are a second generation family-owned business with 50+ years of experience in the industry. We pride ourselves on working closely with our clients to bring their visions to life in front of their eyes, exactly as they’d dreamed it would be. We were also honored to appear in 8 episodes of Property Brothers, where we were able to showcase some of our custom work in collaboration with the Scott brothers. At heart, we are a custom-build contracting company, and there’s nothing quite like watching a homeowner’s vision come to life. Many construction companies only handle certain aspects when it comes to new home consturction, but we’re a full-service firm. That means no matter what challenges your design and build will present, our team of experts will be able to do the entire job, start to finish. From gathering the permits to performing the first excavation all the way through to putting the finishing touches on the home’s exterior and everything in between, we are the full service construction company for all the residential services you’re looking for. No matter the scale of your next new home construction project, our team will bring it to life even better than you’d dreamed. As a first step, you can schedule your free consultation (done in your home) to let us know what you’re looking for in your new home. As the area’s most experienced contractors, we give every single project our full dedication, and stay in constant communication with our clients to ensure the finished home is exactly what they wanted it to be. 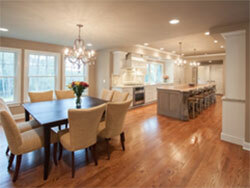 Our residential division can assist you in designing the perfect home additions or remodel for your home. There’s no room in your home we can’t turn into your exact vision, and with our 50+ years of experience, you won’t find a more dedicated team in the region. Call today to set up your complimentary consultation, and let’s discuss the plans you have for your home’s kitchen remodeling and bathroom remodeling project. One of our design and budget specialists will sit down with you to go over your vision. We’ll then turn your ideas, comprehensive budgets, floor plans, elevations, structural blueprints into photo-quality 3D renderings. Our goal is to show you exactly how the finished room/home will look, which will give you an excellent foundation to determine if we’re the right construction company for you. Our insurance restoration specialists work with all types of claims, including fire damage, water damage and mold mitigation insurance for residential, commercial and manufacturing claims. Disasters are tough enough without having to worry about getting shorted by the insurance company. Our trained and certified restoration experts will come in, assess the property and document every detail that might be needed to get your claim approved. We’ll then come up with a claim, using the same software the insurance companies use, that will restore your property to its perfect condition. When disaster strikes, we’re available around the clock, 24/7, to inspect your property and get the restoration process started on everything that will be needed by the insurance company to get the building and your belongings back to their original state. More than just a restoration service, we can also act on your behalf as a consultant or mediator with the insurance company to help ensure you get everything you’re owed. We are fully certified by the IICRC, amongst other organizations, as fire, smoke and sewage remediation specialists. No matter the damage that has occurred to your home, business, or government building, our goal is to revert your property back to its original state - or better - and make it look as if nothing had ever happened. In a case where there is a dispute between the property owner and the insurance company we also provide third party evaluations. 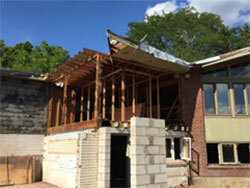 Call today to learn about our restoration consulting services. Nurzia Construction offers all commercial construction and remodeling services for both public buildings and private buildings. Whether you are adding a wing onto your property, or looking to build from the ground up, be sure to get a bid from Nurzia before you make a decision on your next project. Are you planning a construction project for your home, business or government property? Whether you’re looking to remodel an existing space, or build a new property from the ground up, our team can handle the entire project, start to finish. With more than 50+ years in the industry, we’re proud to provide some of the highest quality remodeling services in the region, and would be happy to discuss your next commercial project. 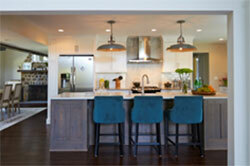 We design and install custom cabinetry and semi-custom cabinetry from Crystal Cabinets. Whether as part of a remodel of your entire kitchen or bathroom or as a standalone upgrade to your room, there’s no single improvement that will make a bigger difference than new cabinetry. Not sure which style of cabinet would look best, or which finish to go with? Set up an in-home consultation with one of our designers and we’ll help you determine which cabinets best fit your lifestyle, your taste, and your budget. Give us a call to schedule your appointment today! Nothing compares to having a personal paradise in your backyard, but that’s just what a custom outdoor living space will be for you and your family! No matter where your imagination takes you, our award winning home remodeling contractors will be able to meet you there, or beyond! Contact Nurzia Construction today if you’re looking for a construction company in Westchester, Dutchess, Putnam, Fairfield Counties and nearby areas. "My small bathroom was in desperate need of a remodel. As soon as I heard about Nurzia Construction, I called and hired them without hesitation. Project Manager Justin and his crew transformed my decrepit, outdated, bathroom in two weeks..."
"Nurzia completed a HUGE renovation for us this past summer - the downstairs was an almost a complete gut job. I don't usually (ever) take the time to write an online review but these guys earned it! I had the pleasure of working with Jeff, Anthony, and John for the most part..."
"Our 27 year old kitchen was well beyond in need of remodeling; the toughest parts were coming up with a design that worked with our limited space and finding a reliable contractor. We spoke to several contractors who either had cookie cutter type ideas or ideas that involved..."